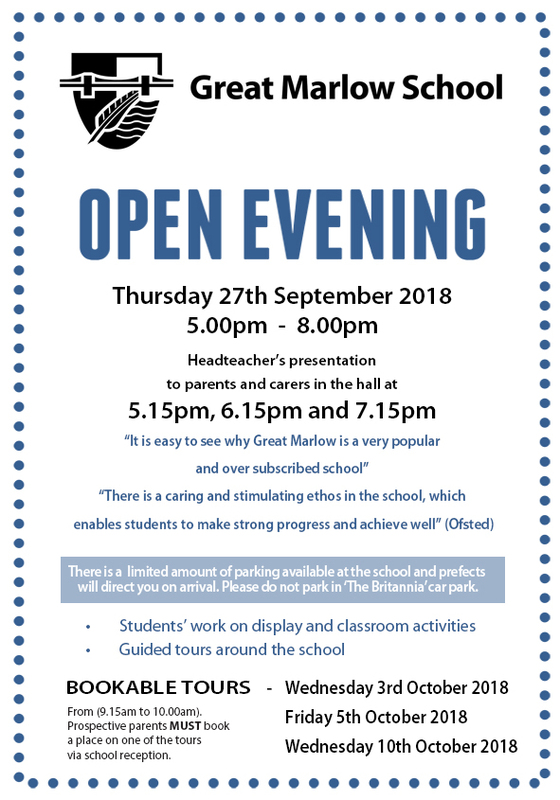 Great Marlow School are pleased to announce that the Open Evening of 2018 will be held on Thursday 27th September, from 5pm to 8pm. As in previous years, there will be three opportunities to hear the headteacher’s presentation in the school hall at 5.15, 6.15 or 7.15. At the reception current students will be available as guides to our visitors new to the school. As in previous years staff will answer questions, while students look at classroom displays and engage with classroom activities. GMS are looking forward to welcoming all who can come. In addition, there are guided tours offered on Wednesday 3rd October, Friday 5th October and Wednesday 10th October. Please note, you have to book a place on a daytime tour. GMS are very proud of their school and are looking forward to meeting prospective parents, carers and students, also welcoming old faces. Please note that there is some parking on the GMS site and students will direct you accordingly. We have been asked that you don’t park in ‘The Britannia’ car park.